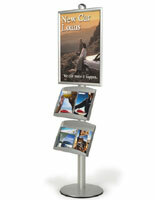 This silver combination poster & pamphlet display is part of our modular Forte line. 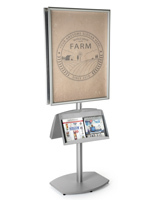 The design of each 73" tall floor information stand has a grooved component channel on each side. 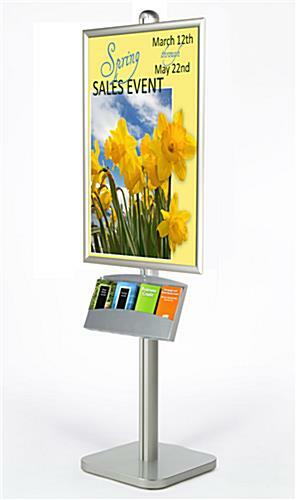 This aluminum combination poster & pamphlet display comes with a 24" x 36" graphics frame that includes a protective acrylic lens. 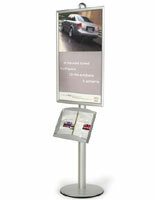 The modular rack is sized to hold 4 sets of 4" x 9" brochures for customers to take away. 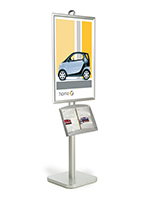 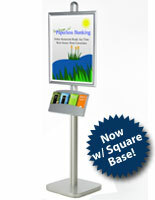 The versatile poster & pamphlet display with weighted steel base is designed for floor use in high traffic areas. 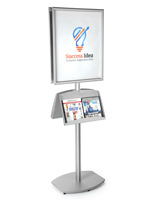 Each 4-pockeet information stand can also be used with additional modular holders from the Forte line (available separately). 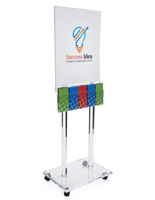 18.0" x 56.0" x 17.5"